They Are Televising in Berlin! "Inventor of the television. For over 80 years, Loewe has invented television, we have kept our 'Made in Germany' promise. Development, production and service departments are still based in Kronach." So reads the history page on the Loewe website regarding its involvement since 1923. 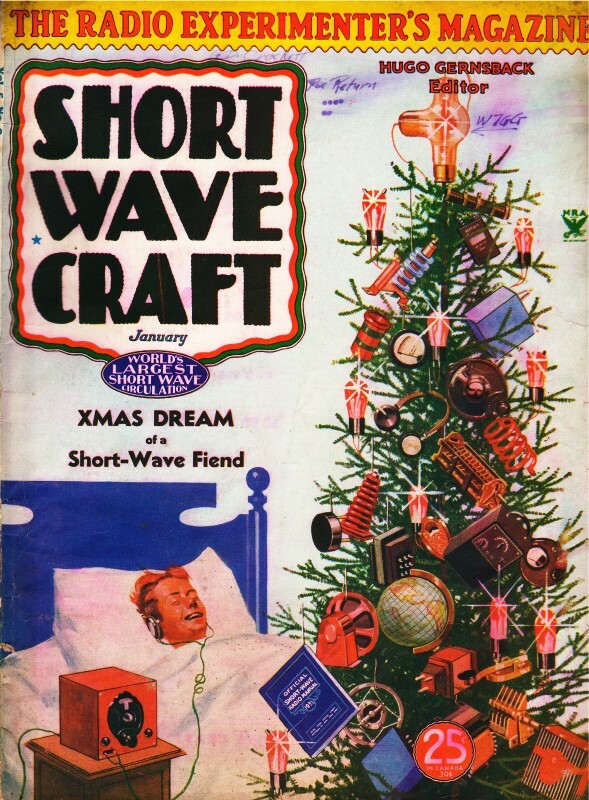 This article, which appeared in a 1935 issue of Short Wave Craft, begins by lamenting America's lag in the development of commercial television; to wit, "practical public television is fast asleep in this country." The German system used 180 scan line at 25 frames/second (today's NTSC spec is 525 lines at 30 frames/second). Digital TV standards have replaced analog for commercial broadcasting; however, Amateur Fast-Scan Television (AFT) still uses the NTSC standard since it plays directly with available equipment. While practical public television is fast asleep in this country, the German and other European television experimenters have been forging ahead, and the accompanying illustrations and discussion give some new light on what we "might have done"! Here we see the latest manufactured model of combination voice and image Television receiver in use in Germany. This is the Loewe apparatus. Front view of the combined "image and sound" television receiver for the Home. 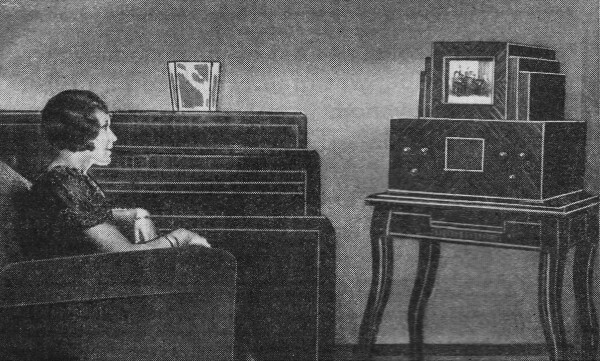 Rear view of the Loewe "home" televisor. 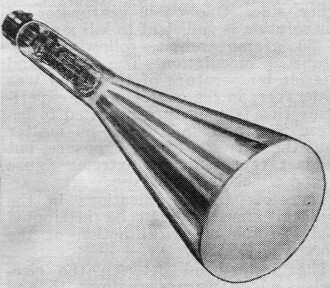 The cathode-ray or Braun tube used to reconstruct the image. Television has been making fast strides in Germany, and several other European countries, including England and France. Practical everyday television in America has, sad to relate, almost gone backward instead of forward and it is a pity that American radio experimenters and the public at large have been for the past two years, and still are, without television except for a few stations which are bravely broadcasting a few programs here and there across the country. All we hear in this country is that the laboratory images are wonderful, but it is too bad that we could not have kept up the momentum in television broadcasting that we had a couple of years ago. The photos on this page just go to show what can be done - this is the latest Loewe television apparatus developed and perfected in Germany. 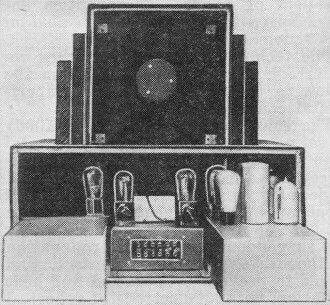 This apparatus is being manufactured in quantity and it not only reproduces the moving television image on the screen of the receiver, but the "sound" as well! The tuner is incorporated in the lower part of the cabinet as well as the control knobs for the framing of the image and the modulation of the cathode ray or Braun tube. This excellent television apparatus was exhibited at the last radio exposition in Germany. The images were very fine indeed, the improved detail being due to the use of as high as 180 lines per inch in the scanning. The wave length used for transmitting the television images in Berlin is 6.92 meters or a frequency of 42,900 kc. The next step will be the use of microwaves, having a length of one centimeter up to one meter possibly. The German Reichspost in connection with the Reichs Broadcasting Company have decided to carry out several elaborate television experiments through the coming months, and to aid in making these experiments, the television image "pick-up" car here shown was designed and built. The sound movies are taken from this truck and the film reel developed in the astonishing time of 1 minute, developing requiring 20 seconds, fixing 20 seconds and washing and drying 20 seconds. The pictures are photographed and sound recorded also, the same as regular "talkie" films, at the rate of 25 frames per second; thus all flickering of the image is practically eliminated. It is interesting to note that with an image requiring 40,000 points of light and 25 frames per second, and 180 line scanning, this calls for the transmission of one million points of light per second; to attain this highly desirable form of "high fidelity" television transmission, a band 500,000 cycles wide would be necessary and this will only be possible by using ultra short waves for broadcasting the television images. If such a high-grade transmission light-spot frequency should be used, we should require a band extending from 200 to 240 meters which is out of the question, as this would block out a goodly part of our present broadcasting stations. In ultra high frequencies we could obtain a 1/2-megacycle channel by using a band extending from 4.96 to 5 meter. The way in which this particular German system works is as follows: The scene is photographed with the usual "sound-camera," either outside or from within the television pick-up car with its large windows; the film is then developed, fixed, washed, and dried in approximately 1 minute, then passed through a regular motion picture projector which has a Nipkow scanning disc and a photo-cell arranged in front of the moving film. * As the film passes by the scanning disc with its many holes, it causes progressive spots of light, line by line, to be impressed on the photo-cell. The variations in the photo-cell current are then passed through a sensitive high-frequency amplifier of 8 to 9 stages, which are then caused to modulate a short-wave radio transmitter. It is interesting to note that there are two different types of receiving apparatus available. The one here shown and intended for "home" use, projects the image on a screen measuring about 8" by 10". A public theater or hall receiver and projector is capable of exhibiting a television picture about 10 by 12 feet. Thanks to the very clever way in which this television system has been developed so that both sound track and image are scanned at the transmitting station simultaneously, positive synchronism is assured at all times between image and voice. The "home" type television receiver uses the so-called cathode ray or Braun tube. All we know in this country about recent television transmission and reception is a few meager reports emerging from the secret laboratories of two or three of the large radio corporations, which state that wonderful images have been reproduced in the laboratory by means of cathode ray tubes. The unofficial story of American television is that one of the large radio corporations is about to build a series of ultra short-wave (about 3 to 7 meters) television transmitting stations in the larger cities and which, owing to the quasi-optical (line-of-sight) properties of these ultra short waves, will only have a short range of 50 miles radius. When and if, these stations are built and put into operation sometime within the next two to five years, then we are supposed to have practical television. Too bad we could not have proceeded the way we were going a couple of years ago with our mechanical scanning systems, so that we could have had some enjoyment receiving the television images which could and should have been transmitted to us during the ensuing dead period of over two years, since the Columbia Broadcasting System and several others went "off the air" with their television transmission. We would undoubtedly have seen a great improvement in the received image by this time, if television had been kept "alive." 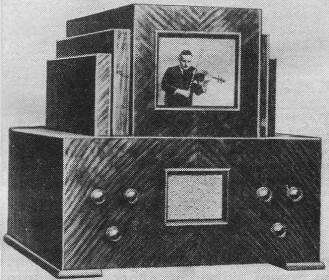 The newest German television system, whereby scenes are photographed from the "pick-up" camera truck here shown, the "talkie" movie film developed in one minute, flashed by short waves to the television broadcast station and picked up in theater or home on short waves, also. One of the surprises that awaits some of the "cathode-ray" enthusiasts for television reception, is the fact that we undoubtedly are going to have a whole flock of mechanical scanning systems also, which experimenters are going to build for the fun and instruction they get out of it, and just because the scanning speed is stepped up to 150 or 200 lines there is no reason at all, according to one of our leading American television and radio engineers, that mechanical scanning cannot be adapted to meet this speed. Another thought is that some form of vibrating scanner, operated by electrical tuning forks or otherwise, will undoubtedly be devised to accomplish the same purpose as the cathode tube, which requires quite elaborate auxiliary apparatus to fulfill its functions as a television scanner. Not only are the cathode tubes liable to be fairly expensive to start with, but at the present time their life is very short, and at times they are said to be quite erratic in their action. The great asset of the cathode tube for television is the fact that the cathode ray within the tube can move at almost infinite speed and it therefore lends itself ideally to high scanning speeds such as 180 lines or more. The ray is caused to move across the fluorescent screen at lightning speed and moves progressively up and down the screen, so as to "paint" the picture or moving image (not a "still" picture), thanks to specially designed oscillators. The currents from these oscillators act through magnet coils or static plates on the cathode beam, and it moves back and forth in response to the oscillating fields.